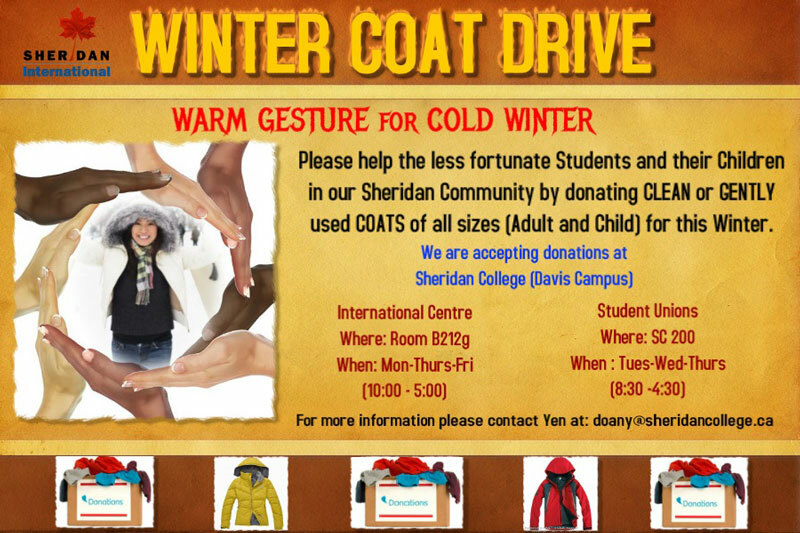 The Sheridan International Centre and Student Union at Davis Campus are working together to make this winter a little warmer for less fortunate students. Until Dec. 6, donations of adults’ and children’s winter coats can be brought to the international office, in B212g, or the Student Union building in room SC200, at Davis. Between Dec. 9 and 13, tables will be set up around Davis for students to retrieve coats for themselves and/or children in their care. This is the first time the coat drive has been done and a lot of the work is just getting the word out. 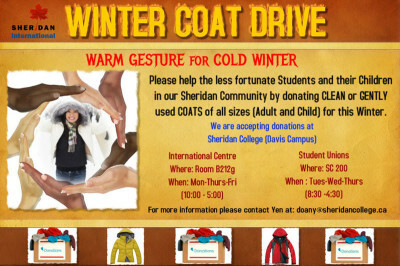 Winter Coat Drive Posters with drop off hours can be found in the halls at Davis Campus. Associate dean of Applied Science and Technology Philip Stubbs first conceived of the idea. Doan brought the proposal to Student Union executive vice-president Tyler Yurechuk, who showed his full support. Nimo Hussein, manager of International Business Development, then assigned Doan to the project. Due to the small size and staffing limitations of the plan, it will only be occurring at Davis this winter. Software Development and Network Engineering student Jaspreet Dhaliwal knew of the coat drive from reading posters in the hallways on campus. “It’s nice to help people in need,” she said. 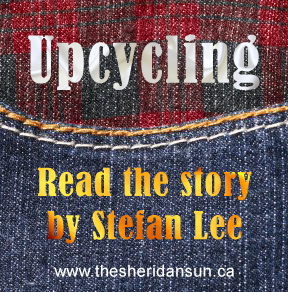 Depending on the success the project, it may be reintroduced and possibly expanded next year. Added by Adam Buck on November 26, 2013.